but, keep on leftside of the road. After about 10 minutes ride on shuttle from Minami Sakurai Station, you get to "Showa" Rest Area and start the bike tour there. If you are interested in shopping at the farmers' market, it is better to do before start. Otherwise some of goods could be gone in the afternoon when you return there. 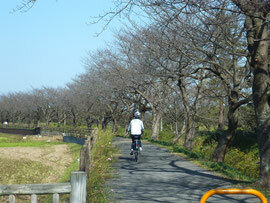 Near the east side of Showa Rest Area, there is 3 kilometer-long row of cherry trees along watercourse. 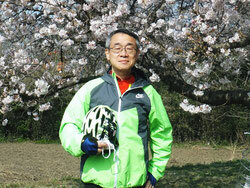 In season of cherry blossom, you would admire the beauty of its rural scenery. After you pass the row of cherry trees, then turn left . Soon you can find Naka River. You go to north along with Naka River. The road along with Naka River is not dedicated for bike, but is less traffic road. It could be safer to keep left side of the road for just in case. Let's switch your way from right dike to left dike of Naka River because the road on right dike is dead-end. 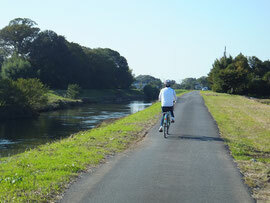 At the end of the road along Naka River, you turn to right and find soon Edo River. 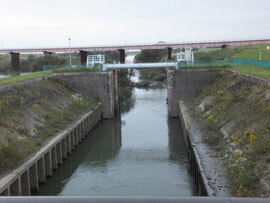 By taking bike road on the western dike of Edo River, you get soon to "Sekiyado" Lock Gate, which is not used now because no boat passing through it to carry materials to Tokyo unlike Edo Era. At "Sekiyado" Castle Museum (closed on Monday), just next to the lock gate, you can find histories of flood prevention work of Tone River basin and industries in the area. 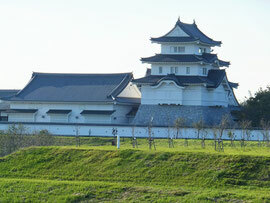 From the 4th floor of the donjon, you can view Tone River, Mr. Tsukuba and mountains around Great Kanto area. 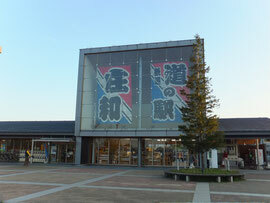 From "Sekiyado" Castle Museum, you take bike road to south on eastern side of Edo River and switch to western side by taking the first bridge. Then you would keep on going south. 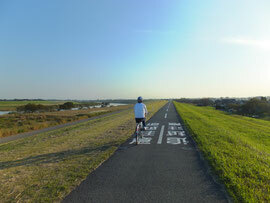 Since the bike road is so wide, it is so comfortable to run by having far view around. 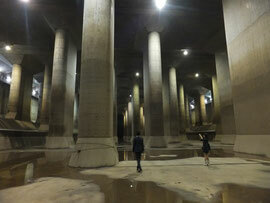 This facility was built in 2006 with 230 billion yen investment for preventing flood in eastern area of Saitama Pref. In the building (closed on Monday), you can see miniatures of the facility. You need reservation to take the facility tour with guide. After this, you soon get to Showa Rest Area.